Roast should be at room temperature, not taken directly from the fridge. Place oven rack on the second level from the bottom. Place small roast in a 14 X 12 X2 inch roasting pan, bone side down. Snuggle most of the garlic, is using, under the fat and spread remainder under the meat. 4lb =12minutes, 7lb = 21 minutes, 26 lb =78 minutes) etc. Increase heat to 450°F and roast for another 15 minutes regardless of size. 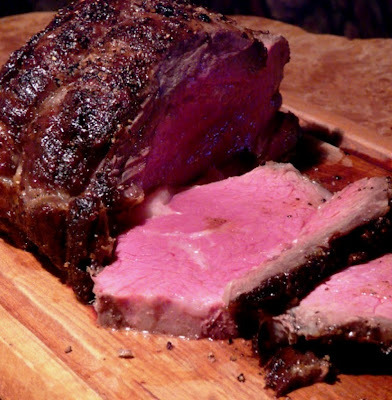 Meat temperature should read 135°F on an instant - read thermometer. increase the 3 minutes to 5 minutes. Transfer meat to a serving platter and let rest. Pour or spoon off excess fat, reserving about ⅛ cup to ¼ cup of fat. Put pan over high heat and add wine. Deglaze pan well scraping with a wooden spoon. Pour liquid into a small saucepan and reserve. Slice meat and pour liquid from saucepan over meat. Enjoy this amazing recipe and many more when visiting thibeaultstable.